A green-eyed detective, an overly protective, rich ex-husband and a dashing TV celebrity compete for smart-mouthed, foolhardy Dani O’Rourke’s attention. Cadging funds to underwrite the Devor Museum’s new installation to house the King’s Jar, a 2-foot-tall sub-Saharan African antiquity found in Kenobia and donated to the San Francisco museum by billionaire Fritz McBeel, falls to staffer Dani O’Rourke. 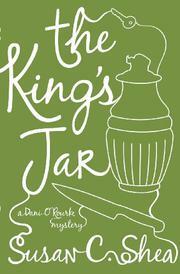 As she’s juggling plans for a gala dinner at New York’s posh Pilgrim Club for wealthy and politically connected dignitaries while soothing the curator’s catalogue challenges, a terrible tragedy occurs: The King’s Jar goes missing from the vault it had been stored in at Warefield University. Almost as dreadful, if rather less mourned, scholar Rene Bouvier, who’d been charged with overseeing the safety of the artifact, lies bashed to death in his university lab. Stepping up to find the jar and the killer, Dani is stymied by conflicting directives from McBeel and his second wife, Jamie, who disagree on whom the jar belongs to, a matter further complicated when Kenobia’s ambassador, Keile Obarri, seems to threaten Jamie and argue with Fritz at the Pilgrim Club. Then Dani finds Jamie strangled in her tony office. Instead of high-tailing it out of the place and calling the cops, she pockets a key and a note partially hidden under Jamie’s body. The green-eyed detective warns her to behave. Her ex-hubby rushes back from the Bahamas to protect her. The television celebrity seals his lies with a kiss. Lawyers, a former wife, and rumors about life, death and bribes in Kenobia will surface before Dani can curl up with her cat, Fever, for a restorative nap. Like Murder in the Abstract (2010): wickedly funny about professional fundraising; very arch about chubbiness and romance; and labored in its attempts to make all the plot holes disappear.